Bo Sanchez the founder of a financial and spiritual mentoring group the TrulyRichClub and a prolific entrepreneur Dean Pax Lapid joined force and had just released their latest art, a book entitled, "How To Turn Your Passion Into Profit - 8 Keys To Build a Truly Rich Business"
If you've been following Bo Sanchez blog, I assume you also read his blog entry with the same title, "How To Turn Your Passion Into Profit". 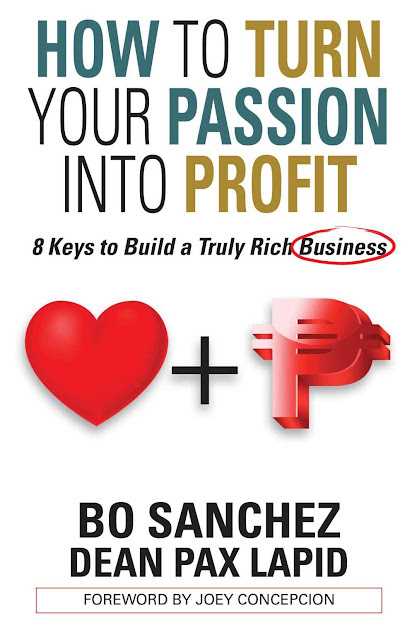 You can check and read it again here: http://bosanchez.ph/how-to-turn-your-passion-into-profit/. In this blog, he encouraged the reader to Find A Business Angle To Your Passion. I like Bo Sanchez when it comes to giving titles and sub titles in his books. It's so compelling. I am not saying he's good in creating a compelling titles only, he is an amazing, superb and a truly soul-striking-and-passion-driver-writer. He is a good writer and I am sure so many people can attest to that. Now, let's talk about Dean Pax Lapid. A lot of entrepreneurs and financial and business speakers know Dean Pax, the co-author of Bo Sanchez latest book. By the way Dean Pax Lapid is the former Dean of Entrepreneur School of Asia. He is also a Professor of Entrepreneurship at Asian Institute of Management, one of the most prestigious business schools in Asia. He is a prolific entrepreneur, creating one new business a year. Dean Pax is also the co-author of Go Negosyo's 21 Steps on How to Start Your Own Business book. In this Go Negosyo book, Ping and Dean Pax discussed the 21 steps of founding a business. It was written in simple, step-by-step manner, easy to understand even by people who did not have background in business and commerce. There is also the T.I.P.S. which helps the reader grasp he or she reads. This book How To Turn Your Passion Into Profit - 8 Keys To Build a Truly Rich Business", I assume will be another best selling book. No questions about the combination of these two great men, well-respected entrepreneurs and best selling authors. Hopefully I can get my copy soon. Well, to tell you frankly I haven't read the book "How To Turn Your Passion Into Profit" yet. I'm looking for it in NBS but no stock yet. Once I read it, I promise, I will try to create a review. I think you probably heard this one too... "Do What You Love, the Money Will Follow". That's true. A nice principle to follow. This is simple principle. An entrepreneur following this simple principle can really make big difference and a big dent to the universe. I cannot tell you the full details of these four principles, but I am sure you get the message. The message is simple, Do What You Love, the Money and Success Will Follow. The question is how do you find your true passion. OK. You should be thanking me now. This one is from the Bo Sanchez private mentoring club also. At first, many of us don’t know what is really our passion. But how will we know? Where do you excel? Where do people say you are superb in? Where have you been successful in the past? What gives you most joy? Happiness? Fulfillment? Satisfaction? What do you love to do? That even if you don’t get paid, you’ll still do it? What do you value or consider most important? That's if, I hope you and I will be inspired once again by this book of Bo Sanchez and Dean Pax Lapid. Please leave you comment below if you read this book already. Once again, if you really wanted to change your financial, spiritual and business life, JOIN the TrulyRichClub now and let's join together in this journey to financial freedom and abundance.